Heavy duty marking for primary school textbooks can leave teachers overwhelmed and pupils underworked. Headteacher Clare Sealy explains why she banned marking in her primary school for an entire term, and the strategies she used to move beyond prescriptive text book marking. I have a confession to make. I was an early adopter of heavy duty marking. As a headteacher, I already rejected many expected nostrums of ‘good’ primary school practice. On the grounds that they were inefficient, time-wasting rituals that bore little actual learning fruit. For example, I never asked for planning, leaving the level of detail committed to paper up to individual teachers. I wasn’t that big on display. I reduced our end of year report to a format that took half the time to complete and provided a day out of class to complete them. PPA could be taken home if so desired. So why did I believe in heavy duty marking? Once upon a time I had been motivated by research on feedback and inspired by the system invented by a local super-head. So I introduced a rigorous new system. It involved green pens, marking stickers, pupils responding through dialogic marking, the lot. It did actually have a positive impact, particularly on writing. Expecting pupils to read and respond to marking before improving their work paid dividends. Work improved. We were very proud of our system. Our books looked marvellous, with their green pen pupil responses and multi-coloured stickers. They were marked within an inch of their lives! At cluster moderation events or when consultants came in for work scrutinies, people were seriously impressed. We got used to always having the most impeccably marked books. Ofsted were impressed. I was impressed. Despite the incredible workload, teachers didn’t complain about the system because they bought into the idea. We all believed we were doing the right thing for our pupils; yes it was hard work but teachers expect to work really hard for their pupils. There was no upswell of popular discontent. I didn’t have teachers leaving teaching because the workload was too intense. So why did I make the change? I was less sure heavy duty marking was having the same impact in Maths. Here, our approach was to mark the actual calculation and follow up with a reasoning question. Could the pupil write success criteria for this procedure? Could they write a word problem for one of their calculations? Could they prove an answer was correct by doing the inverse? This was not a bad thing, but I sometimes wondered why reasoning wasn’t an integral part of our lessons. Why was it tagged on at the end? As for the other subjects, marking became marking for literacy, rather than feedback to help improve subject knowledge. I’m all for insisting that written work across all subjects is high quality, but marking was no longer leading to improved outcomes for subject specific content. There was no denying that the marking policy had massive workload implications, despite staff generally supporting it. Younger teachers who didn’t drive would travel to and from school on public transport with suitcases full to the brim with exercise books. Until then, I just accepted that a heavy workload was part and parcel of the profession. The notion of teacher-as-martyr was rather appealing and made me feel all noble, to be quite honest. Having said that, it was only noble if it actually made things better. Initially, reading Joe Kirby’s blog post on alternatives to marking challenged my faith in our current system. It helped me realise that, like the profession as a whole, I had conflated ‘feedback’ with ‘marking’. While research shows that feedback has a very positive impact, marking is only one way of giving feedback. But, in its use of teacher time, it is horrifically inefficient. I came to realise that because marking books happens outside of the lesson and outside of where learning takes place, it is not the best way to give feedback to children. As well as voraciously consuming teachers’ free time, often the gap between learning and feedback blunts its effectiveness. I also considered how heavy marking places the onus of checking and improving work on the teacher, but not the pupil. Our practice spoon-fed pupils, showing them mistakes and omissions without actually asking them to hunt mistakes down themselves. The focus for our development work that year had been the ‘Maximising Impact of Teaching Assistants Project’ (more on this in my blog post on growth mindset and the MITA project). This was part of a longer, two-year research focus on growth mindset in which developing pupil autonomy and self-reliance were key aims. So why – I began to ask myself – did our marking policy not reflect this? Why were we doing the work for our pupils, instead of getting them to do it for themselves? They needed to do the thinking about what was missing – not us. Read more on instilling a growth mindset in your pupils here. 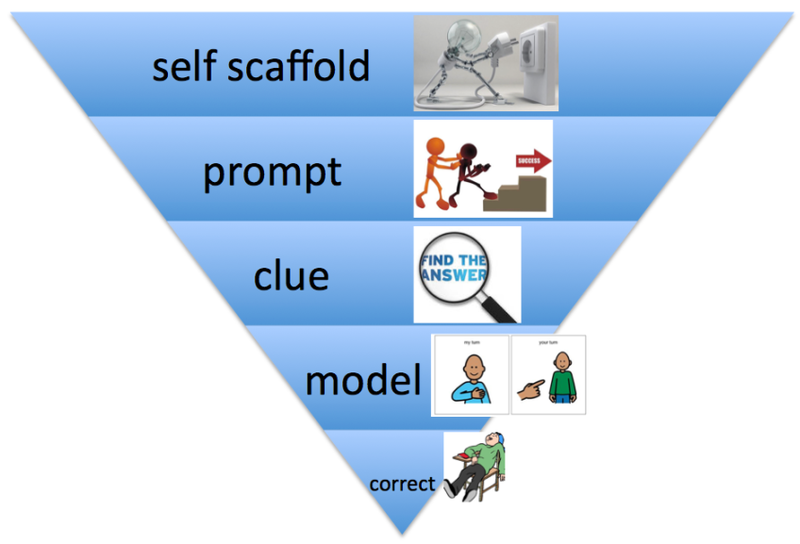 The triangle reminds TAs that when helping children learn, it is vital to intervene as little as possible, giving children space to do the hard thinking for themselves. The top of the triangle, at its widest part, is self-scaffolding. Moving further down, the narrowing triangle shows how only some pupils need clues. The very bottom represents just giving pupil the correct answer. Naturally, this should be avoided at all costs. Read here for what the best schools do to make effective use of their teaching assistants. Our marking system had adults thinking very hard, eating up their weekends when they should have been playing with their own children or taking that wheeled suitcase somewhere exciting. Or possibly even both. Regardless of its faults, I was apprehensive about changing my policy. I had a litany of questions and concerns. How exactly would I go about it? Joe Kirby’s list of alternatives might work well in a secondary setting but would it translate to a primary context? How would it work in practice? Two other things gave me the courage to move on. The first was the teacher workload review of marking; the second the review of marking undertaken by the Education Endowment Foundation. Which found that actually there was very little research into the effectiveness of written marking. Reading these helped me to realise I’d inflicted an onerous, time-devouring policy on staff without positive research to back it up! Trying to move on was hard. Our policy was very prescriptive; use this colour pen for this and this sticker here. I read about the approaches at Michaela Community School and at Shaw Primary School. It all seemed disconcertingly vague compared with our codification of colours. Still, I thought we had better give the approach a try. So in June 2016 I shared my thoughts with the teachers and showed them how these schools gave feedback instead of remote marking. Then, I said that for the remainder of the summer term, I was temporarily banning them from doing any marking at all (unless it was done in lesson with the pupil). They were free to experiment however they liked. Though of course, they must read pupils’ books and give the class feedback. Then, the following September, we would evaluate what had and didn’t work and create a new policy from there. I banned marking entirely because I knew my teachers would find it hard to wean themselves away from such an embedded approach. So I made them go ‘cold turkey’ for 6 weeks. The great thing was, it worked. Teachers found it was surprisingly straightforward to move away from marking. Then with full support from my staff, in September we agreed how we would proceed for the rest of the year. Our new policy starts out with the assumption that all children can work independently given prior input. It gives them take up time; it lets them struggle for a bit. Above all, it makes sure they’re doing the hard work, not you. Read my next blog post, replacing my prescriptive school marking policy, to find out how I implemented our new minimal marking system for the better of pupils and teachers. Clare has written a brand new series of blogs based around the well known secondary school book “How I Wish I Taught Maths” by Craig Barton. She has analysed and adapted the information present in the books for KS2 classrooms, so take a look at the first blog in the series which is an introduction to cognitive load and see how you can bring this knowledge into your school. If you liked this, read the first post in our ‘Confessions of a Primary Headteacher’ series, where @OldPrimaryHead1 discusses the perils of school leadership, and why keeping it simple is the only way to go.